A couple of days ago, Gross Domestic Product (GDP) figures of Q3 of 2014-15 were released and everyone got stunned by the estimated growth rate of 7.4% indicated in the report. I thought it will be a good time to shed light on the GDP figures and the methodology of calculating GDP. 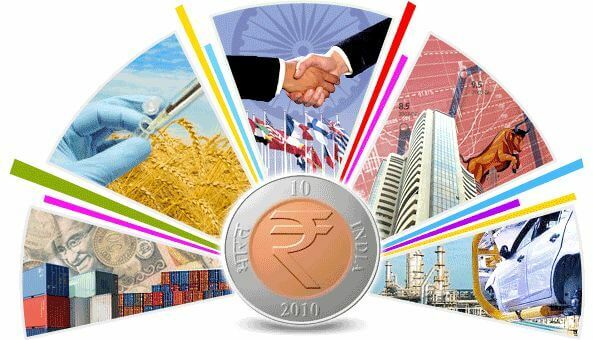 How to Calculate Gross Domestic Product (GDP) of India? Gross Domestic Product is the summation of monetary value of all the goods produced and services provided in the economy over a year. GDP is considered as the key indicator of measuring the performance of the Economy. GDP is usually expressed in percentage, computed by comparing it to the previous GDP. This percentage value is called GDP Growth Rate. Commonly quarterly and yearly comparisons are made. In India, GDP figures are collected by the Central Statistics Office (CSO) which comes under the Ministry of Statistics and Programme Implementation (MOSPI). The raw data are collected through compiling National Accounts, conducting Annual Survey of Industries and Economic Censuses, compiling Index of Industrial Production and of Consumer Price Indices. The GDP figures are releases on quarterly basis with a delay of approximately 1 to 2 months, which are than revised to release the final figures. For instance, GDP figures of Q3 (Sep-Dec) of 2014 were released on 9th February, 2015. The release dates of the GDP figures were fixed in advance and can be accessed at MOSPI Advance Release Calendar. The Expenditure approach takes into account the total expenditure on finished goods and services procured in the economy for example consumer spending, government spending, capital investment, imports and exports. The Production Approach breaks down the economy into various economic units such as agriculture, forestry, construction, fishing, mining, manufacturing, electricity, gas etc. and then compute the value by deducting the total value of inputs from the total value of production/output (goods or services). The Income Approach takes into account the income earned by the Individuals (wages) and corporate (profits) in the process of producing finished goods and services. GDP = GVA + Taxes on Goods/Services ? Subsidies on Goods/Services. Above tables shows the GDP figures of Q3 of 2014-15 and 2013-14. But why there are 4 figures for each quarter? The answer is, CSO always calculates and publishes both Real GDP and Nominal GDP figures. Nominal GDP (at current prices): Nominal GDP is calculated without taking inflation into account. Thus, even if there is no actual growth in the actual value of GDP, the data would always show the continuous growth in GDP. In simple terms we can say that, in absence of any actual increase in GDP, the growth rate shown under Nominal GDP denotes the inflation rate. Real GDP (at 2011-12 prices): Real GDP is the actual measurement of growth in GDP. Real GDP is calculated on prices with respect to a given base year (2011-12) and these inflation adjusted values show a true measurement of growth in economy. Thus, a total of 4 slightly different figures are published. Agriculture includes crops cultivation, animal husbandry, forestry, horticulture, aquaculture, fishing, sericulture etc. Industry includes construction, textile, pharmaceuticals, petroleum products etc. Services include Information Technology, Health Services, Tourism, Education services etc. In India, over 51% of the population (approx. 64 crore) is directly or indirectly are engaged in Farming, but the contribution of Agriculture sector is only 17% towards the Gross Domestic Product of country. Over 27% (approx. 34 crore) of Indian Population is employed in Service sector, while the contribution is 57% in the country?s?Gross Domestic Product. Remaining 22% of Indian Population (approx. 28 crore) is associated with the Industry and has given an average contribution of 26% to the country?s?Gross Domestic Product. Since Independence, the contribution of Agriculture sector is on the spree of declination and has gone down to 17% from 43%. On the other hand service sector has seen a remarkable rise in the contribution from mere 15% to 57%.. Industry sector has always given a constant contribution towards GDP ranging from 32% to 26%.